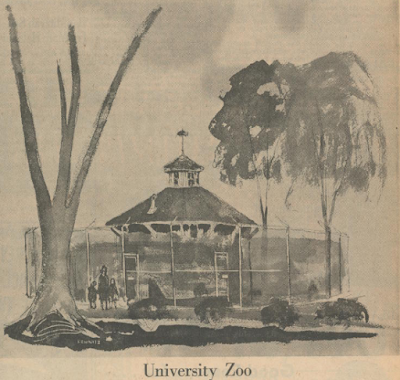 From 1929 to 1963 U of M had a very small zoo on the corner of Geddes and Washtenaw. I remember my dad telling me about it when I was a kid. There was a fondness in those memories, but also some sadness as the zoo was quite small. Though University briefly flirted with expanding the zoo to a 40 acre zoological garden, those plans never came to fruition. Ultimately, the U of M's small zoo was disbanded. You can hear all about it on toady's Ann Arbor Stories.